I connected with Debbie Wakabayashi, President of Salmon Paws Doggy Treats, via email and she was good enough to answer a few questions about her business. I continue to be amazed at how many small businesses have been born during this economic crisis. l. What motivated you to start your company? 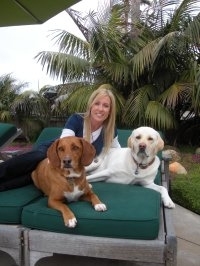 My inspiration for my business comes from my own dogs, Zoey and Hudson. I wanted to give them an all natural treat that didn’t have any fillers and preservatives in them which a lot of pet treats have these days. My first dog, Zoey, had gotten violently sick on chicken treats. So I said, “No more chicken”. I saw how Zoey reacted to the scent of salmon whenever I would prepare salmon in my kitchen for my husband and I to eat. And I thought why not a salmon treat! – Our love for our own dogs is put into every bag of SALMON PAWS! 2. Why salmon and how did that happen? Our family processing plant where the products are made: Bellingham, WA. My brother in law has been making human grade salmon products for 20 plus years in an F.D.A. approved facility. I decided to start the Salmon Jerky dog treats after we got our first dog, Zoey. We are family owned and operated. 4. Would you share an innovative marketing idea you had that worked well and helped your company get through the last couple of years? It’s all about customer service, I include a personally hand-written note to all my Internet orders. Another thing that has helped is the following: In this economy, it was hard to consider starting the business selling ‘higher end pricier treats’. So I decided to offer “30 Day Trials- No Risk”. They did not have to buy upfront. I told them to just try the product and let it speak and sell for itself. Once customers would buy SALMON PAWS, they would go back to the retailers and tell them how their dog loved it so much and would go nuts for it. LOTS OF WAGGING TAIL STORIES! Most of the stores would call back and be so excited about ordering more. Salmon Paws is more costly, but knowing you are giving them an all natural, human grade, nutritious treat every day to benefit their health and lives is so worth it! These are my 4- legged kids and they are worth it! 5. Tell readers a little about your association with the no-kill shelter you donate to and how that came about? I just didn’t start my business to make money, I wanted to make a healthy treat for my dogs. I had been searching for over a month to find an organization that I wanted to give back to. Finally my heart connected with an organization. While watching tv I saw a segment on Gillian Lange and the Lange Foundation on “The Oprah Show”. Right then and there I knew Gillian Lange’s foundation was the one I wanted to give back to. Ten percent of all internet purchases goes to the Lange Foundation in LA You can check out Salmon Paws website here. DDB will have a review coming up! (Tashi is *very* excited!) Many thanks to Debbie Wakabayashi for sharing her story with us! I'll have to keep my eye out for these. Always looking for good things to give my kiddos! So interesting! Can't wait to try Salmon Paws treats for my new pup. I LOVE that it is all natural! HI Mary & Peggy, Yes, our Yellow Lab is HUDSON & our Red- Lab/Beagle is ZOEY. Although a few friends call her SALMON!!! They are my 4 legged kids as you all can relate too! I can't thank you enough for trying Salmon Paws! I put so much love into every bag! May your 4 legged kids be just as thrilled to TRY SOME! By the way.... they are HUMAN GRADE, You can try it it too! REALLY! Tail Wags! Ok, I gotta ask - do you save good news/success stories for when you've had to post a bunch of recalls? Or is it just the rhythm of the universe? ;-) Anyway, enjoyed reading about this, although salmon is one treat Frankie doesn't covet. He's a meat (white or beef, no matter) guy. That's great that you noted your dog's interest in a food and went with that instead of trying to impose what you thought dogs would like to eat on them first. I don't know which of your dogs is which, but we had a yellow lab named Hudson! Next post: Salmon Paws Treats, Four Paws Up!